My head and heart are still reeling after attending We Day in October. It was absolutely awe inspiring and I’m having trouble putting what I felt into words which is why I haven’t written about it until now. Processing. Much processing has happened to get me to even attempt to write about this. I mean, where do I even start? We Day connects world-renowned speakers and performers with thousands of elementary and secondary students and educators in an inspirational setting to learn about some of the most pressing local and global issues. Students can’t buy a ticket to We Day, they earn it through service; by making a commitment to take action on at least one local and one global initiative of their choice as part of the year- long educational program called We Act. 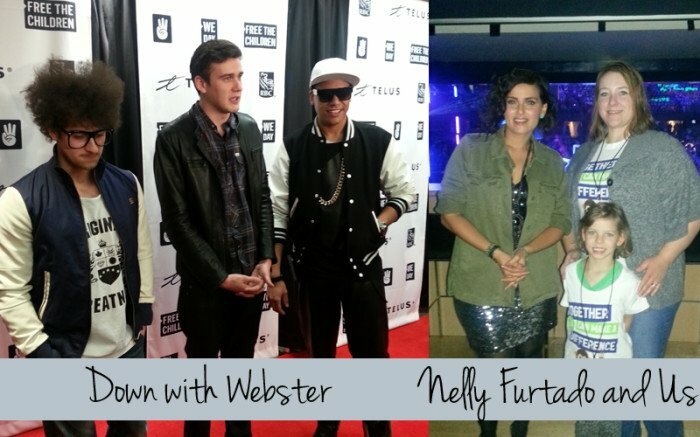 There was fantastic musical performances from Down with Webster, Nelly Furtado, Shawn Desmond and more. I can only imagine how awesome it would have been to be a teenager seeing all this and to be there because of doing something worthwhile. There were many speakers and among them was Spencer West, Magic Johnson, Martin Luther King III and 10 year old Hannah Alper who spoke about Malala. I’m getting misty eyed all over again just thinking about it. So many powerful words. Words that would encourage kids in the audience to go out into the world and choose a cause and make a difference. Words that would ignite passion and love towards those who are less fortunate than us. Those who are willing to risk their lives in order to go to school. Those who struggle daily to obtain water and food and those who would never dream of having all that we have here in Calgary. Now that We Day is over and the fanfare has died down there’s still more happening. Much more. The parts that are hard. Now it’s time for the work and the intention and all that REALLY matters. BlackBerry has opened their Build a Village Award program across Canada this year. The BlackBerry Build A Village Award Program will be giving 50 remarkable students from across Canada the opportunity to embark on a life-defining experience as a volunteer in one of BlackBerry’s adopted villages in Kenya and India. Submissions for students between the ages of 14 and 18 for summer 2014 trips is now open. Between now and January 15th, 2014, students can submit their entry at www.freethechildren.com/buildavillage. To be eligible for the Program, students will have to demonstrate passion, leadership qualities, traits of initiative, work ethic, empathy, maturity, contributions they have made to their local community and their desire for positive change. We365 is a safe social network that revolves around social change. Signing up for a We365 account donates 1 vaccination to a child in a developing nation. This new platform is designed for kids to log their volunteer hours, interact with challenges and connect with others who are passionate about the same causes. TELUS launched this initiative along with their new TELUS WISE program to help parents and kids safely navigate social networking channels. I want you and your kids to get involved. Download the app for your smart phone. The very least you will do is donate a vaccination. The most you can do? That’s up to you. Don’t have a smartphone? TELUS has generously given me a BlackBerry Q5 to give to one of you so you will be able to access the program and get started. You can enter to win below. Eeep. This is a new platform for me. I’ll contact support. Thanks for letting me know! 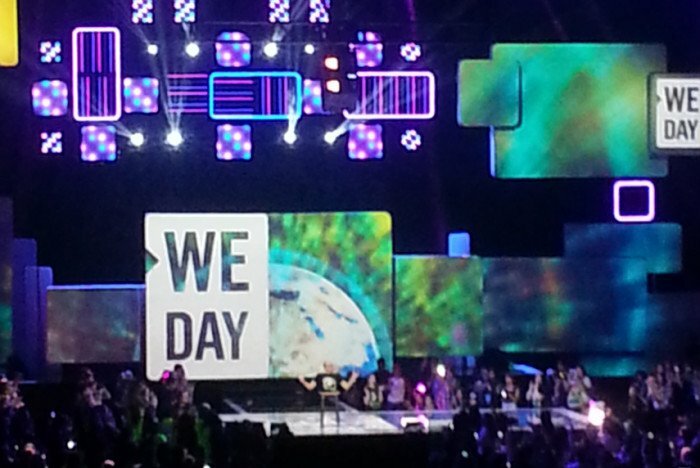 My son participated in We Day in Vancouver and this year in Winnipeg. He loved it! Very cool event! I’m excited for my kids to be old enough to participate. When I log into my dashboard I still see your entries. Try clearing your browser cache? Glad it’s working now! Phew! but it doesn’t seem to add to the total of my entries. Thanks for the contest heather, going to try to get my neice to goto We Day @ waterloo! This program is ideal positive modeling for today’s youth. Focusing on how they can truly make a difference, even at such a young age, has a profound effect in their hearts for the rest of their lives. Thanks so much for the opportunity Heather. I live in YYC too. My two Teen Boys attended. Such a Fabulous Cause and Message for All!